Do you have an upcoming early morning business meeting, product launch, employee training, or other corporate session? If you’re the one who is tasked with planning this type of event, then you’re in for a real treat. At Etai’s Catering, we want to help make your corporate meeting and/or event go off without a hitch. That’s why we offer delicious and fresh breakfast catering options that are ideal for these types of events. 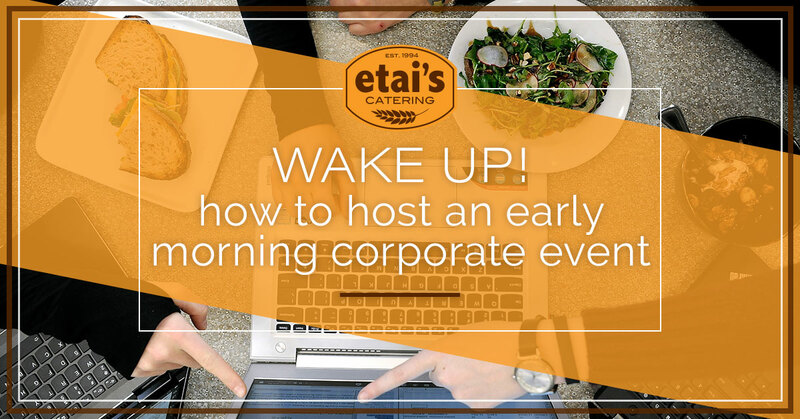 Keep reading to learn a few tips on how to host an early morning corporate event, and keep us in mind when it comes to corporate catering in Denver. It’s early. It’s a business function. The simple fact of the matter is, people are going to be downright sluggish by the time they roll out of bed and to your early morning corporate event. That’s why as the event planner, you need to be prepared to hit them with a dose of the sweet nectar every business professional knows and loves: coffee. Have fresh, hot coffee, tea, and other beverages at the ready for your guests so that they can be alert and refreshed before the event even gets underway. This will increase attentiveness and happiness throughout the room. Here’s another irrefutable fact: no matter where your event is taking place, there are some people who are just not going to want to be there. Whether they are stressed out about work, their mind is wandering elsewhere, or they would just rather browse social media apps on their phone, it’s your company’s job to make this event entertaining and engaging. Whether it’s through a motivational video, an interesting keynote speaker, or networking activities, you’re going to need to find away to push interactivity so that everyone becomes personally invested in the event. If you’re so inclined, you can improve company morale by offering perks and/or free giveaways at your event. Whether it’s through sponsored silent auction items, a free lunch raffle, or company-branded swag, there’s no question that enticing people through giveaways and goodies is a great way to make your event more successful. This is particularly true when your event takes place in the early morning hours. Whenever a business meeting or corporate event is taking place, the attendees are going to assume that something more than coffee will be provided. It’s up to you to find the best breakfast catering service in town. Give them what they all want by having a catered breakfast with everything from freshly baked pastries, delicious breakfast sandwiches and burritos, fruit, juice, coffee and more. At Etai’s Catering, we can help you plan and prepare your corporate event with the freshest corporate catering in Denver. We craft and bake our early morning goodies by hand at our state-of-the-art Denver bakeries and deliver them straight to your event. Let us take care of the delicious assortment of goods, which your guests will all be looking forward to, so that you can worry about everything else going on. Give us a call or order catering online today from Etai’s — your home for the very best in fresh, local catering since 1994.